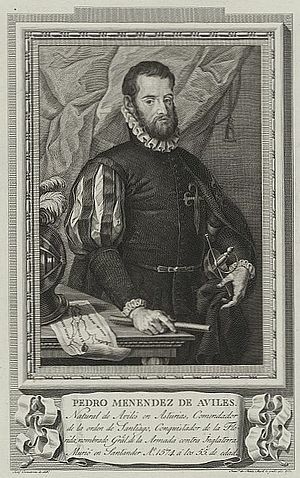 Fifty-six years before the Pilgrims celebrated their feast, Spanish explorer Don Pedro Menendez de Aviles arrived on the coast of Florida. He came ashore on September 8, 1565, naming the land on which he stepped “St. Augustine” in honor of the saint on whose feast day, Aug. 28, the land was sighted. Members of the Timucua tribe, which had occupied the site for more than 4,000 years, greeted Menéndez and his group of some 800 Catholic colonists peacefully. 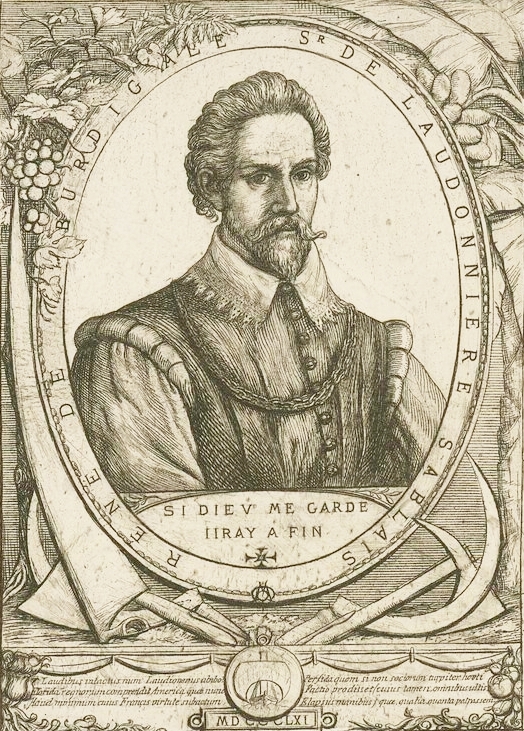 From what we know of the food provisions stocked on Menendez’s ships, the meal that the Spaniards and Timucua shared on September 8, 1565, was probably cocido, a stew made from salted pork and garbanzo beans, laced with garlic seasoning and accompanied by hard sea biscuits and red wine. The Timucua, as invited guests, would have contributed food to the communal meal–likely local game and fish, along with grains, corn, beans, and squash. 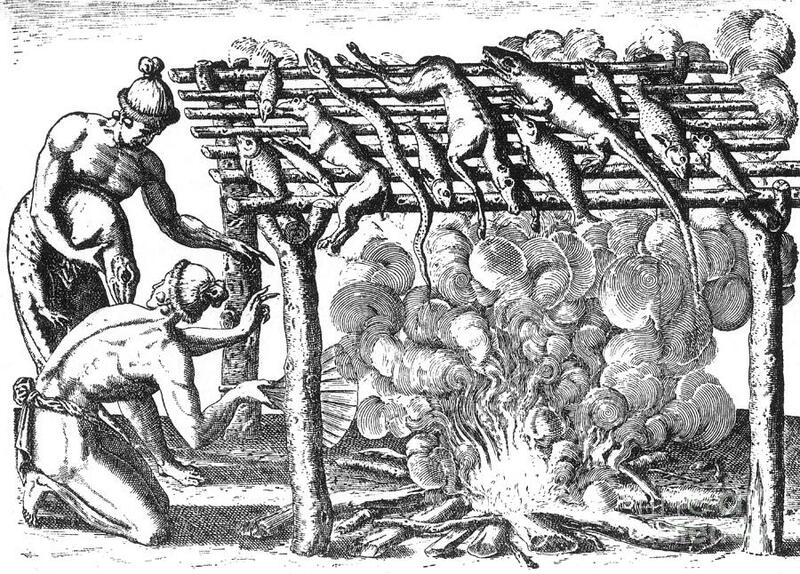 In a very early version of barbecue, the Timucua roast native fowl and marine animals, including alligators. But here’s the problem with Gannon’s First Thanksgiving in Florida. It wasn’t first either. Jacque Le Moyne’s engraving of the Timucuan chief showing Rene Laudonniere the marker erected by Jean Ribault in 1562. 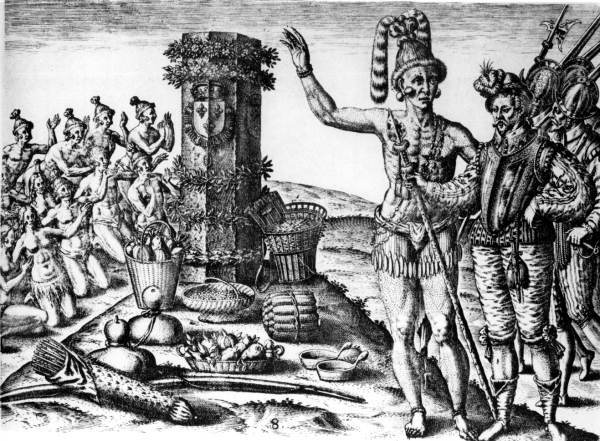 Given the depleted state of the French food provisions after their long journey, much of the celebratory meal would likely have been provided by the Timucua, who were excellent hunters and had access to enormous granaries that were used to store and dispense commonly harvested agricultural goods. Since we know quite a bit about the Timucuan diet, we can surmise that Laudonnière’s feast would have included corn, beans, squash and pumpkins (which the Timucua farmed on a limited basis), as well as local fowl, oysters, shrimp, mullet, deer, and, yes, alligator. (Apparently, the Timucua preferred it smoked.) The group likely also enjoyed fresh cherries, blueberries, blackberries, mulberries and muscadine grapes—although there’s no record of any pie. Can we conclusively determine that Laudonniere’s 1564 feast is the mother of all American Thanksgivings? Probably not. It must be noted that many prior European explorers offered prayers of thanksgiving upon their safe arrivals in Florida, including Juan Ponce de León, in 1513 and 1521, Pánfilo de Narváez in 1528, Hernando de Soto in 1529, Father Luis Cáncer de Barbastro in 1549, and Tristán de Luna in 1559. Also, assuredly, each of these explorers came into contact with native peoples and, most likely, would have had to rely not only on their kindness and goodwill, but also their food. 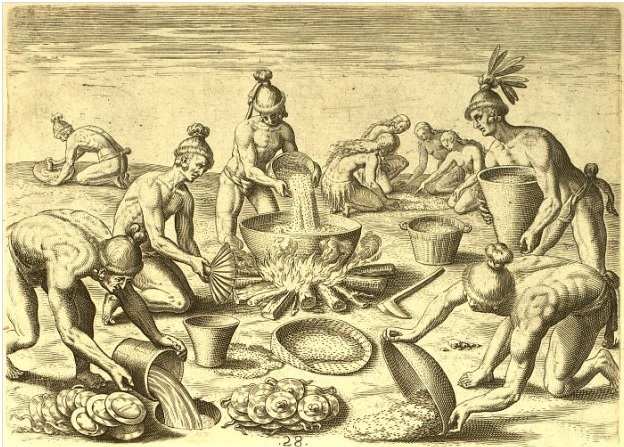 The Timucua, as depicted by Jacques Le Moyne, prepare a feast for to commemorate Laudonniere’s visit.. So, given the historical evidence, why does the story of the Pilgrims dominate Thanksgiving, instead of either the French Huguenots or the Spanish Catholics in Florida? It helps to remember that it is the victors that typically write history. The English beat out Spain and France for control of North America. Therefore, it is English laws, customs, ceremonies and traditions that have been promoted as our foundational myths. Another reason, perhaps, is that when the United States officially established the November Thanksgiving holiday in 1863, Florida was still part of the Confederacy. In fact, Lincoln may have popularized the theme of Pilgrims and Indians eating happily together as a metaphor for how the divided Union and Confederate states might once again achieve unity. Despite such efforts, several southern states refused to celebrate Thanksgiving because they thought it was an abolitionist plot. Indeed, Thanksgiving didn’t become a national holiday until World War II. The only thing we can claim with reasonable certainty is that, wherever and whenever it occurred in Florida, the first Thanksgiving did not include turkey, cranberry sauce, green bean casserole or Parker House rolls. But this Thanksgiving, as we gather in gratitude for America’s bounty and promise, we would do well to reflect that the true inspiration for this beloved holiday can be traced right to our own Florida backyard.